Why do “undocumented immigrants” coming to the U.S.
“Undocumented” immigrants come to the U.S. looking for a better life for their families. Some come from countries that have become dangerous, and they seek a safe place where they can raise their families. Many travel through dangerous terrain and risk their lives looking for a safe haven. Isn’t it a crime to come into the U.S illegally? Many foreign nationals legally enter the country on a valid work and travel visa, and fail to leave before their visa expires for a variety of reasons. “Unlawful presence” in the country is not a crime. It is a violation of federal immigration law to remain without legal authorization, but this violation is punishable to civil penalties, not criminal. Chief among these civil penalties is deportation or removal. “Improper entry” or “border jumping”, which is which is an attempt to enter the US at any time or place other than by designated immigrations officers is considered a federal misdemeanor for an alien. What countries do these immigrants come from? There are immigrants coming into the U.S. from all parts of the world. Nora’s kids are most from Central and South American, the Caribbean and India. The families that Nora helps are hardworking people that often work in the agricultural industry. U.S. law prevents them from attaining a license without legal paperwork. However, even with this restriction they find ways to seek employment and often are forced to work for very low wages to feed their families. If one parent is deported, the parent left behind has to take care of the rest of the family and is even further hindered in providing for their children. Nora’s contributions supplement their need. If a parent is deported, don’t they take their children with them? If a parent is undocumented, and caught, they will be deported and sent back at the expense of the U.S. government. If their child was born in the U.S., that child is an American. They will not be forced to leave, nor will the U.S. government pay for them to be sent back with their parent. The deportee would have to pay for their travel expense. Most times the deportee does not have the funds to do so. If they are American children, why doesn’t the government assist them? Children under 18 that do not go into the foster care system are not eligible to receive government assistance without applying for help through their parents. Since their parents have been deported they do not have social security numbers which would be required to receive assistance. How do you give guardianship of your child to Nora? Giving guardianship to Nora is as simple as having the parent contact her and ask for her assistance. Proper paperwork must be filled out and an understanding of the guardianship process must be established for the parent and the children. Why don’t these children go into foster care? Do all of the kids Nora has under her guardianship live with her? “Deferred Action for Childhood Arrivals” is a policy that allows certain illegal immigrants, who entered the country as minors, to receive renewable two year period of deferred action from deportation and eligibility for a work permit. The policy is non-permanent and does not grant legal status. What is the difference between Nora’s kids and the Dreamers? Nora’s children are born in the US. They are American citizens that were born to immigrant parents. Dreamers are children that were born in another country but came here with their parents and attended school in the U.S. They are not American. 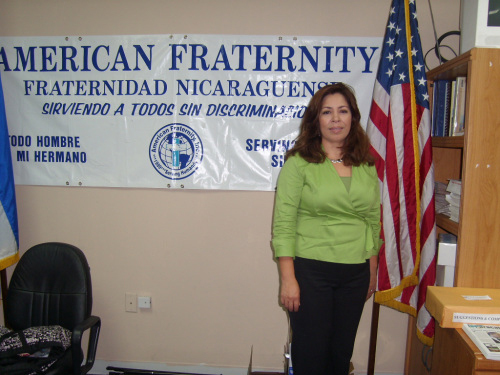 The Nora Sandigo Foundation is in strong supporter of a humane reform of the current immigration policy in the U.S. Nora has organized many trip to Washington D.C. to advocate for Dreamer and American children born to undocumented parents. She advocated for a legal path to legal status on their behalf. How is Nora Sandigo Children Foundation funded? Nora is funded by private and public donations, much of which she personally donates.